You can’t escape the fact that we are staying healthier longer. No bad thing. However, approximately 416,000 people now live in nursing homes. This is 4% of the population aged 65 years and over, rising to 16% of those aged 85 or more. The care market is literally booming and set to develop even further in the coming years. Ensuring that our elderly have a decent level of comfort is close to the heart of international flooring specialist Gerflor. The Orchard Grove Care Home is a care centre for the elderly, located in Prospecthill Circus in the Toryglen area of Glasgow. This 120-bed residential unit was named by the residents and has eight units. Each unit has been named after a fruit to reflect the name of the home. There is also a day centre based at Orchard Grove which has its own entrance and reception to welcome people using this service. The Orchard Grove Residential Care Home needed flooring solutions that could meet their exacting standards of safety and provide easy cleaning and maintenance. A crucial element of the final flooring choice for the end user would have to respect that many of the residents have dementia and the flooring would need to empathise with this. The facility required some 2000m2 of flooring that could deliver the perfect solution for their halls, en-suites, in-house hairdressers, staff changing facilities, cleaner’s cupboards and kitchen areas. Providing a long-lasting result would be paramount for Gerflor in supplying the correct balance of flooring products which included; Taralay Impression Comfort, Tarasafe™ Standard and their outstanding Mipolam Cosmo. Nearly four years on and in ‘situ’, the overall specification has been delivering fantastic results all round. As a true healthcare, multi-specialist and with over seventy years’ healthcare experience, Gerflor has grown and developed to become an expert in the care home field by creating, manufacturing and marketing innovative, decorative, durable, hygienic and environmentally-responsible flooring for a host of healthcare-related solutions. 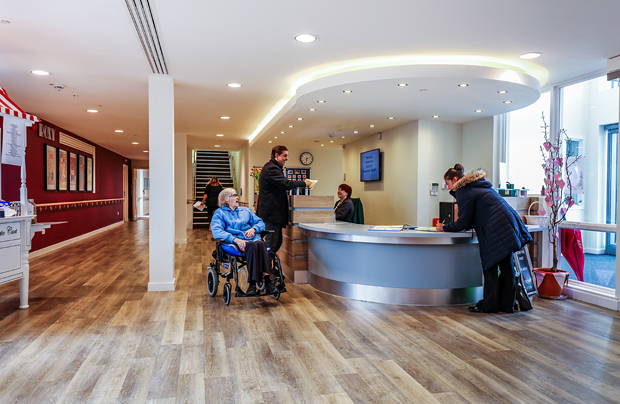 Providing the UK nursing home sector with a range of products that deliver comfort, safety and durability is perceived to be pivotal by Gerflor in addressing this developing market and needs of the residents and staff alike. Delivering a host of contemporary, classical, stylish flooring solutions is seen as vital by Gerflor for supplying this growing sector. The Tarasafe™ vinyl safety flooring range is available in over 80 finishes and is reinforced with a glass ﬁbre grid, suitable for use in all areas of heavy trafﬁc where slip-resistance, durability and hygienic conditions are required. Using mineral crystal particles, rather than the industry standard carborundum, Tarasafe™ with its improved performance, is easier to install, lighter and more flexible to handle. The range has a maximum hygiene rating meeting the EN Standard 22196 for anti- bacterial activity (E. coli – S. aureus – MRSA) (3) returning >99% levels of growth inhibition and comes with a 12-year warranty. Tarasafe™ is stain and chemical resistant and comes with the unique SparClean® surface treatment thus no polish for life. Tarasafe™ is a hugely popular choice for a host of environments; education, healthcare, leisure, hospitality, housing and in any applications, that require slip resistance to be maintained. Mipolam Cosmo from Gerflor is ideal for heavy traffic areas in healthcare, education and other busy environments. Mipolam Cosmo also offers low potential for slip (≥36 wet) when tested to BS 79762:2002. It’s also easy to maintain and provides outstanding stain resistance. By combining the renowned hard-wearing Mipolam Cosmo with its revolutionary, patented Evercare™ surface treatment, Gerflor has redefined the standards for smooth homogeneous calendared flooring. Also, specified and perfect for a vast swathe of nursing home applications Taralay Impression Comfort from Gerflor is an acoustic multi layered vinyl floor covering available in 2m wide sheet, with a group T wear rating. Taralay Impression Comfort comprises a Very High Density (VHD) foam backing reinforced with glass fibre and a printed design that’s protected by a transparent wear layer (0.65 mm thick) which offers 19 dB sound insulation and an indentation resistance of 0.08 mm. The product is protected by a UV cured surface treatment Protecsol® which is easy to maintain and permanently eliminates the need of an acrylic emulsion (metallisation). It does not contain any heavy metals or CMR 1&2 and it is 100% compliant with REACH. The product emission rate of volatile organic compounds is < 70 µg/m3 (TVOC after 28 days – ISO 16000 -6). It is also 100% recyclable. For designers, the range offers 160 references and includes 21 wood effect references, covering the spectrum of wood colours in 10 stunning designs. Taralay Impression is now also available as Taralay Impression Initial which is a perfect ‘entry level’ flooring solution that addresses a host of applications. A crucial element of the specification would also need to ensure that the Light Reflection Value (LRV) would not exceed 15 on the LRV scale. Happily, the Gerflor products specified all easily met the required criterion.